UW Medicine is one of seven U.S. sites testing whether a warm-preservation system is as effective as puting organs on ice for travel. UW Medicine transplant surgeon Jorge Reyes with the liver organ care system involved in the clinical trial. In 2015, UW Medicine in Seattle was first in a national study to transplant a heart that had traveled between donor and recipient in a blood-circulation machine instead of an icy cooler. Now its transplant specialists are ready to test a similar device with donor liver grafts. 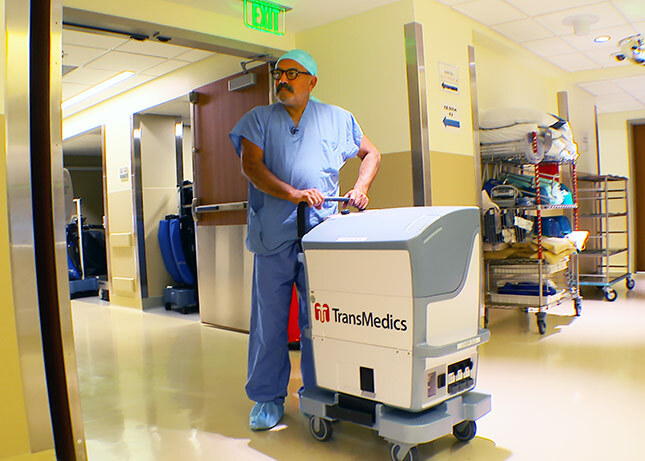 UW Medicine’s transplantation program is one of seven in the United States, and currently the only site west of Texas, participating in a randomized trial of an Organ Care System manufactured by TransMedics. The trial intends to enroll 300 transplant-listed patients to learn whether the warm-preservation system is effective for transporting cadaveric donor livers. “We’ll be comparing whether recipients fare better than they would with traditional technology. Cold preservation versus warm preservation – what produces a better outcome in terms of observed damage and recovery from damage, which all organs experience when preserved for transplantation,” said Dr. Jorge Reyes, chief of transplant surgery at University of Washington Medical Center. Warm perfusion brings blood oxygen and other nutrients to the donor liver during transport, Reyes said. “With this machine, we are bringing in blood oxygen and other nutrients so the cells are awake, metabolizing and healing,” he said, making a prospectively healthier graft. The window between liver recovery and successful transplant can span eight to 20 hours. As with the “heart in a box” device, the longer-term idea is not only to extend the range of the organ-recovery team, but also to make more potential donor organs viable. Reyes described a common scenario of a car accident that results in a fatal injury to someone who has consented to organ donation, or whose family has. The person’s organs, however, are in shock because of the accident; their liver’s enzyme levels make it less viable for transplant, especially into a very sick recipient. The liver’s unique ability to regenerate its cells allows Reyes to consider what-ifs that are even greater leaps from what the current trial will measure. Reyes understands that is hopeful conjecture. For now, the machine must first demonstrate “non-inferiority,” which means it is no worse at transporting organs than the current delivery via handheld cooler. As of September 2017, 317 people awaited liver transplants in Washington, Alaska, Montana and north Idaho, according to LifeCenter Northwest, the regional organ-procurement organization.